If you want to get some brain exercise, try a Twitter talk with #michaeljfox.org. It is an experiment in multitasking because after promptly reading the tweets, you have to answer back quickly and include a hashtag so your tweet goes to the right recipients. Also, if you are a thoughtful Tweeter, you won’t forget to occasionally give the participants some kudos with a retweet or a favorite symbol. Multitasking is challenging, and consequently, I stumbled and even had to be reminded that I wasn’t using the #FopxPDchat on some of my tweets. If you want to give your brain a workout, try this novel method of chatting about your PD status. Plus you can learn a few things along the way. 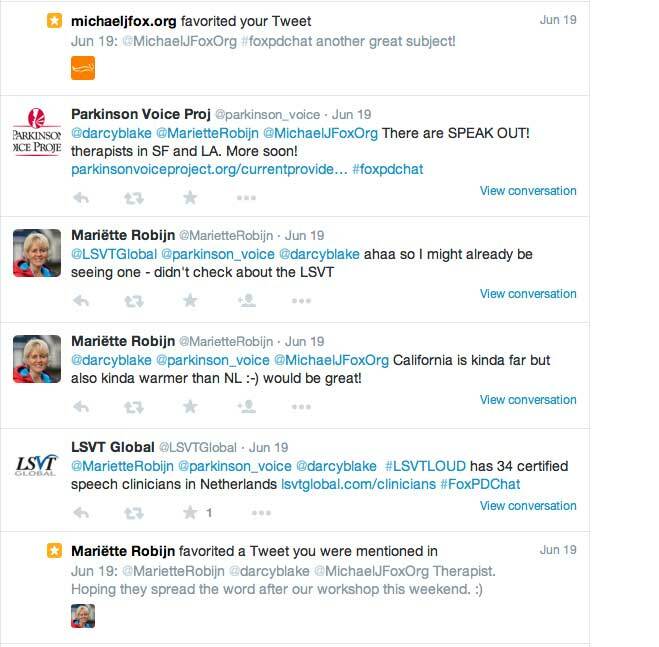 The topic at the #FoxPDchat on Twitter on Friday was titled How Parkinson’s Affects Speech and Swallowing. The experts included Parkinson Voice Project, a Dallas non-profit dedicated to helping people with Parkinson disease regain their voices. LSVT Global from Tuscon, Arizona also chirped. They work on improving the quality of life for individuals with Parkinson disease by delivering evidence-based speech and physical/occupational therapy treatments. Rachel Dolhun, MD, a Movement Disorder Specialist led medical communications @michaelj fox .org. Just as I was perfecting my Twitter skills, the session came to a close. It was a wrap for this month’s #FoxPDchat! But we can join them July 17 for a chat on Parkinson’s disease and the gut. That’s one not to miss!